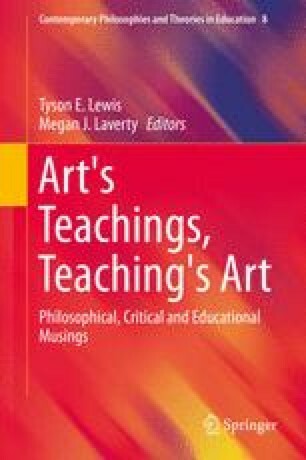 In this chapter, Lewis argues for a new understanding of the art of teaching beyond what Giorgio Agamben refers to as the ontology of effectiveness in modern, Western society. Taking as his starting point the current terrain of educational discourse and practice, Lewis criticizes the dominance of learning as a symptom of this modern ontology which conflates potentiality and actuality, being and doing. The problem with effectiveness is that it leaves no ontological ground for impotentiality (the ability not to be this or that). And for Agamben, this means that there is equally no place in effectiveness for freedom. But Lewis also goes one step further and argues that even the most ardent critic of learning, Gert Biesta, reproduces the ontology of effectiveness. Through a careful reading of Biesta’s work, Lewis discovers the need to reinvent teaching—and teacher education in particular—beyond both poiesis and praxis. What is needed here is a form of teaching that does not erase impotentiality but rather embraces it. To do so means understanding the gestures of the teacher as theatrical gestures, and thus beautiful.